Chillum, MD (June 6, 2018) - Prince George’s County Firefighter/Medics are planning a wish send-off party for a very special young teen and celebrating his wish come true to go to Walt Disney World® Resort later this month. 15-year-old Juan will celebrate the granting of his wish come true at the Chillum Fire/EMS Station along with his family and the firefighters. Juan suffers from a nervous system disorder and can’t wait for his wish to go to Walt Disney World Resort later this month. NOTE: Parking at the fire station is limited. Media should be creative and safe when parking your vehicles. 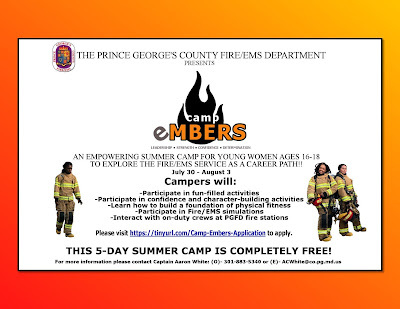 The Prince George’s County Fire/EMS Department is excited to announce its inaugural girls’ summer camp “Camp Embers,” which will be taking place from Monday, July 30 through Friday, August 3, 2018. The camp is open to female high school students (ages 16 to 18) and is completely free of charge to participants. However, campers will have to provide their own blue pants and black boots as part of the uniform. The camp will offer a unique insight into life as a Firefighter/EMT, with optimism to encourage young females to consider the fire service as a career, either after high school or college. Campers will participate in 5 days of fun-filled activities involving classes, physical training, and Fire/EMS simulations. 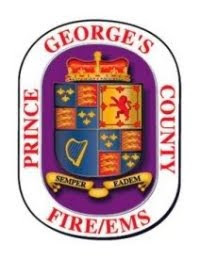 They will also have the opportunity to interact and ask questions with on-duty crews at Prince George’s County Fire/EMS Stations in order to experience the everyday life of a Firefighter/EMT! 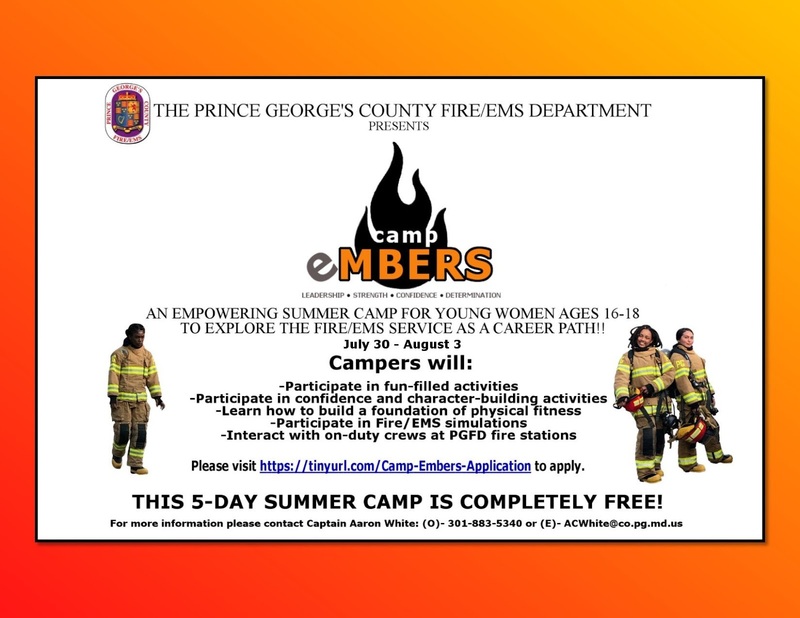 Safety is our top priority; camp participants will be supervised at all times by the highly trained professionals of the Prince George’s County Fire/EMS Department. Please carefully review all included camp materials, including the proposed schedule of events, medical information and physician clearance for participation, assumption of risk and waiver requirements. All sections of this packet must be completed in full; incomplete packets will be rejected. Please write legibly in black ink; unreadable applications will also be rejected. Please take care in completing the application and provide thoughtful answers to the essay question in Part 5 as only 20 applicants will be selected for participation in this year’s camp. Applicants are expected to be responsible and demonstrate a self-starting attitude. Applicants must be aged between 16 and 18 years old by the first day of camp, also in good physical health in order to participate in the rigorous activities. Additionally, all applicants must pledge to participate in the entire program. Planned absences are not acceptable because of the limited space available. The nature of the program requires full attendance to achieve the total benefit. If you believe that you will be absent for any portion of the program, we ask that you do not consider applying for the camp. All applications must be RECEIVED no later than June 15, 2018. Applications can be founding by clicking here. If you have any questions regarding the application packet or process, please contact Captain Aaron C. White at 301-883-5340 or email your question to: acwhite@co.pg.md.us. We will be very happy to assist you.